Should garden literature be in the fantasy section? Should garden literature be listed in the “fantasy” section of the bookstore? My book reviews have always been about books I like and recommend. Gardening books are some of my favorite winter reading and gift suggestions. However, I was disappointed by “Gardenland,” by Jennifer Wren Atkinson. No color photos—only a dozen black and whites! It was described as a book about garden writing. Among other topics she discusses is how over the centuries it hasn’t always been about how-to, but how writers support our garden fantasies. We started dreaming about floriferous and bountiful gardens when industrial agriculture took away the romance of the family farm. But this is an academic textbook, it turns out, written at 20th-grade level, compared to this column clocking in at 9th -grade level. We need a popular literature writer to interpret these very interesting ideas. The 17-page bibliography is a useful list of garden writers like my favorites, Michael Pollan and Eleanor Perenyi, and introduces many more. For those of us who want to be immersed in fantastical gardens, there is a new book, “GardenLust, a Botanical Tour of the World’s Best New Gardens,” by Christopher Woods. You can justify buying this 8.5 x 10.5-inch, 400 page, full-color, $40 extravaganza as it will give you inspiration for your own garden—if you have a million dollars to spend. At the very least it may count for your recommended daily dose of nature viewing. You can preview the book at http://www.timberpress.com. I haven’t decided if I want to order it or if I can wait for it to appear at a used book store. Will what’s new today look boring by then because everyone copied it, like Karl Foerster grass and Russian sage today? Maybe it’s best consumed fresh or at least when there’s a good discount. Atkinson thinks books about vegetable gardening are not in the realm of fantasy garden books. She would be mostly wrong when it comes to Eliot Coleman. He’s come out with a photo-filled 30th anniversary edition of his book, The New Organic Grower, A Master’s Manual of Tools and Techniques for the Home and Market Gardener.” He’s a successful year-round market vegetable grower…in Maine. If he can do it there, we can do it here. Coleman does it without a lot of expensive machinery. He’s learned how to appeal to customers and how to handle seasonal employees and he passes that information along to the reader, and the nuts and bolts of growing. Barbara Damrosch, Coleman’s wife, contributed a section about how she grows and sells cut flowers at their farm store as well. Even if you aren’t planning to go into business, this is an engaging introduction to organic growing from a farmer happy to share his knowledge. You can just imagine Coleman jubilantly giving you a garden tour of Four Seasons Farm. Successful organic growing might not be as much of a fantasy as you think. Seed catalogs have long been known to be fantasy literature. Those Burpee babies hold giant tomatoes in their outstretched little hands. It’s an old fisherman’s trick that uses perspective to make the fish, or tomato, in the foreground look huge in comparison to the person in the background. As I become a plant nerd, I can get excited about catalogs with absolutely no pictures. However, the catalog that gets my vote for most beautiful is Botanical Interests Seed Catalog, 2019 Season. Their seed packets feature original botanical art. It makes me want to cut out the pictures and frame them—both flowers and vegetables. Botanical Interests is a family-owned company in Broomfield, Colorado. Its seeds can be found nationwide and in our local, independent garden centers. 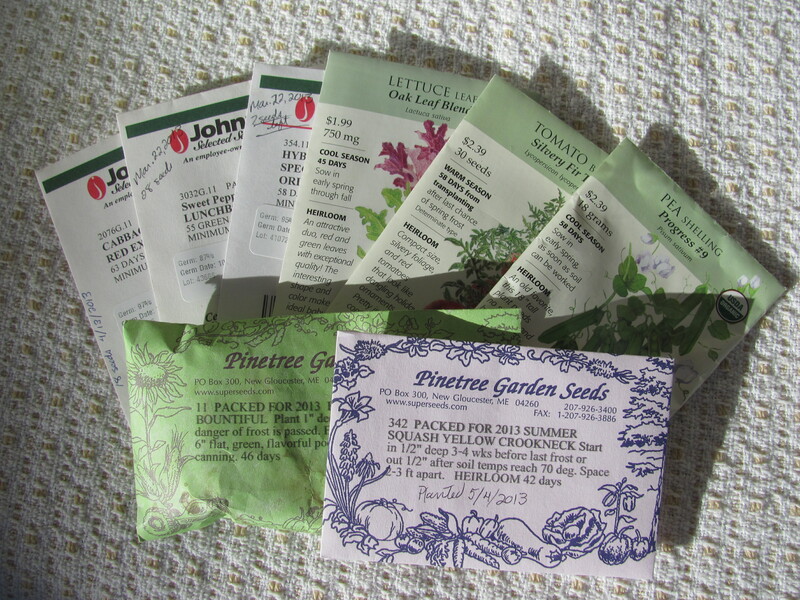 Both the website, https://www.botanicalinterests.com, and print catalog contain a wealth of information, as do their seed packets, printed inside and out. For instance, in the catalog there is an article about the national movement for local cut flowers. In the last few decades, most cut flowers purchased at grocery stores and florists in the U.S. have been imported from South America, raising concerns about pesticide use and the carbon footprint of travel. Check out https://slowflowers.com/. It’s like the slow food movement. Here in Wyoming we need fantasy garden literature for the five or six months when nothing blooms outdoors. Besides the catalogs and coffee table books, don’t forget to look for garden shows on Netflix. Several are British and make a nice getaway. Categories: Flowers, Garden books, Gardener's wish list, Gardening, Public gardens, Seeds, Uncategorized, Vegetables | Tags: botanical gardens, Botanical Interests, Christopher Woods, Eliot Coleman, garden, Garden books, garden writing, gardening, Gardenland, Gardenlust, Jennifer Wren Atkinson, organic farming, organic gardening, seed companies, The New Organic Grower, vegetable gardening | Permalink. Can I call myself a gardener if I buy blooming bedding plants and keep them alive until frost? Possibly. But my real test is whether I can start something from seed indoors, which I haven’t done in 20 years. And, even though it’s February, now is not too early to start thinking about that. My inspiration is the pep talk Kathy Shreve and Barb Sahl gave the Master Gardeners’ class recently. It looks so simple: florescent shop light, sterile seed-starting medium and pots, proper watering, a little air circulation and fresh seed. Seed. There’s the sticky spot. Some plants I like don’t do well in Cheyenne or would need more sun than my shady yard offers. This is my experiment for the coming growing season: raise from seed at least one easy annual flower and a fast tomato. Why all the bother? Because just as I can bake my own bread, even though it’s much easier to buy a loaf at the bakery, I want to see if I can grow from scratch. There are several seed companies out there that cater to our unique gardening needs. For starters, I was already familiar with Maine’s Pinetree Garden Seeds. This company offers a reasonable climate match. I ordered from them years ago and Shreve does today. Visit www.superseeds.com or call 207-926-3400. Shane Smith, director of the Cheyenne Botanic Gardens, mentioned three seed catalogs recently that match other aspects of our challenging growing conditions. For high altitude, try Seeds Trust, located in Littleton, Colo., www.seedstrust.com, or call 720-335-3436. For drought-hardy plants, High Country Gardens in Santa Fe, N.M., offers recommendations on xeric gardening, as well as plants and seeds. Visit www.HighCountryGardens.com, or call 800-925-9387. For a comprehensive flower and vegetable catalog, check Johnny’s Selected Seeds, which is another Maine company. Visit www.johnnyseeds.com or call 877-564-6697. You can also check local garden centers, but do read the seed packets carefully. Unfortunately, I don’t think anyone specializes in plant varieties that are hail and wind resistant. For my summer project, Wissner recommended I start with a cherry tomato plant. The fastest tomato I could find, maturing in 55 days, is called Gold Nugget, which produces yellow cherry tomatoes. Local gardeners who want to grow tomatoes might want to look for tomatoes that mature in 55 to 60 days, she said. This means with luck, you’ll harvest your first tomato 69 to 80 days after May 25–that is, between Aug. 2 and 13. The average first frost date looms barely more than a month later, about Sept. 20. Why all the extra time? Vegetable seed packets and catalogs will tell you how many days it takes for seeds to germinate and how long until harvest time. In reality, you need to extend those time frames by many days, Wissner said. When Wissner starts vegetables indoors, she first adds another 14-20 days after germination to allow plants to grow to transplant size. She then adds another 14 to 20 days after transplanting outdoors. That accounts for transplant shock. At that point, she can start counting the stated days to maturity. For my annual flower, Wissner recommends cosmos, which produces brightly colored flowers. The cosmos I’ve chosen, a dwarf variety in a mix of colors, germinates in seven to 10 days. Maturity is at least 75 days for some cosmos varieties so if I want flowering plants to put out in May, seeding indoors the first of March might not be too soon to start. But since even dwarf cosmos could be 2 feet tall at flowering, they’d get too big for my set-up, so I’ll wait a bit. And both the flowers and the tomato will need “full sun,” –at least 6 hours per day. I’ll have to think about where to fit them in my shady yard, or which tree to cut. It’s easy to see why buying well-developed plants from the nurseries is so popular when, for instance, some varieties of tomatoes are rated at 120 days to maturity, the number of days after seed germination before the first fruit can be harvested. Next month I’ll prepare my seed-starting equipment. Digging in the garden is still months away, even if wind keeps evaporating the snow. The first hurdle to choosing plants that will thrive in your yard is understanding the climate. The newly revised USDA Plant Hardiness Zone Map (http://planthardiness.ars.usda.gov) shows Cheyenne in Zone 5b, meaning our maximum cold temperatures are -15 to -10 degrees Fahrenheit. Because of our 6000-foot elevation and northern latitude, we also have a short growing season. Cheyenne’s average first frost-free date is May 25—that’s considered a safe time to get your plants in the ground. After that, the growing season is only 90 to 110 days long, according to Catherine Wissner, University of Wyoming Laramie County Extension Service Horticulturist. You can see why season extenders like Wall O’ Water, hoop houses or high tunnels— modern, light-weight greenhouses—are popular here. They can push the planting date earlier by weeks. Note: Using Catherine’s formula and the catalog information, I figure I’ll need to plant the seeds four to six weeks before May 25, in early April. If I decide to try Wall O’ Water, giving each plant its own little protective, water-filled, plastic walls so that I can transplant them earlier, I will have to start seeds earlier. Categories: Choosing right seeds | Tags: climate, flower, frost-free date, seed, seed companies, tomato, USDA Plant Hardiness Zone Map, vegetable | Permalink.